Residents and visitors to northwest Lower Michigan need more choices in how they connect to places, goods and people. They consistently express this through public input and increasingly through personal action; nowhere more clearly than in the Grand Vision, where 90 percent of respondents identified a more walkable, connected community as a priority. One way to support this vision is to embrace a "complete streets" approach to transportation planning, design and construction. Complete streets planning focuses on the multi-modal design of the road itself. In other words, roads are designed to be safe, comfortable and inviting for individuals of all ages and abilities. There is no single prescription as to how to do this — in fact, complete street facilities should not all look the same. A rural approach to a complete street may be as simple as a wide shoulder or a bus transfer station, where an urban approach may include sidewalks, bicycle lanes, lighting and transit stops. Over the past five years, complete streets have gained popularity at local, state and federal levels. Michigan is a leader in this effort, with more complete streets policies than any other state. 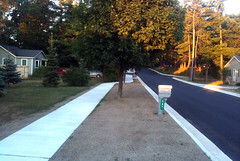 Regionally, the city of Traverse City, the Acme Township Planning Commission and the village of Frankfort have all passed local complete street resolutions. These polices recognize that more attention needs to be focused on how all modes of transportation are accommodated on our roadways. Why is complete streets important? In a time when budgets are tight and resources scarce, a complete streets approach leads to the most efficient and effective use of our infrastructure investments. It's better for our economy — studies show that walkable and bikeable communities are places people want to live and they are willing to pay for those services. It's better for our community — providing transportation options helps get people where they want and need to go; helping everyone move safely around the community and access employment, recreation and retail destinations. It's better for our health — both people and the environment. Reducing single-vehicle trips, consolidating infrastructure, and incorporating stormwater design elements are important ways to improve air and water quality. Providing safe and comfortable choices for walking and bicycling is a great way to help people improve their physical and mental health. A strong multi-modal transportation network is important to the economic and social sustainability of our region. With grant funding from Rotary Charities, this spring TART Trails, in collaboration with the Land Information Access Association, will kick off an outreach and education effort designed to help residents and local agencies understand what complete streets means and how it can be applied when planning and implementing transportation projects. Building on last year's efforts, the Complete Streets subcommittee of the Grand Vision Transportation Network will host a series of educational events about complete streets approaches to road planning, design and construction. To learn more, or get linked in to the Complete Streets subcommittee, visit: www.thegrandvision.org/complete-streets-coalition. Julie Clark is executive director of Traverse Area Recreation & Transportation trail. Subscribe to the Grand Vision Newsletter!